Updated to 1.6 for people preferring this mod (ported from 1.4 to 1.6) over the default, inline Private Message notification. Version 1.0.4 now removes the default notification on activation, and will add it back on deactivation! Special thanks to Paretje for helping me out with some stuff! 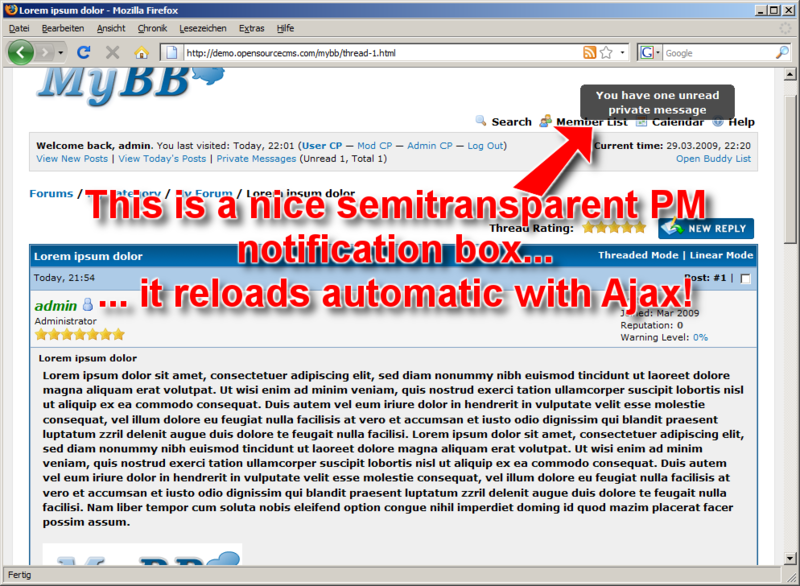 Download the unreadpm.php file and put it in your /inc/plugins folder. Activate it from the plugin manager of your admincp and you're good to go! You can change the message along with the table background and border colours from the admincp. Shochu, who started to develop this plugin would like to say the following: "Also, I wanted to thank MusicalMidget because I used his boardmsg plugin as a starting point for this plugin. Hopefully he doesn't mind :P"